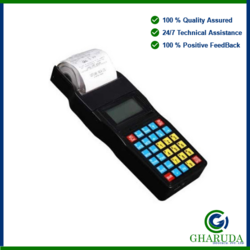 Leading Manufacturer of htm-210 handheld ticketing machine from Chennai. It is the advanced technology based HTM-210 Handheld Ticketing Machine with the Graphic display. It’s powered by a large capacity battery and consumes low power. It supports regional Indian languages. It has 100km print head life and inbuilt battery backup. It is built for applications like Bus Ticketing, Micro Finance, Pigmy & Loan Collection, Parking and Billing Etc.